In a medium bowl combine jello and boiling water. Stir with a rubber spatula until dissolved; cool. 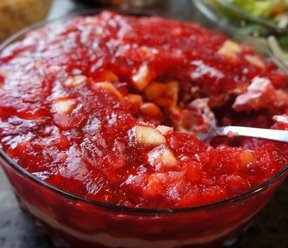 Add bananas, pecans, strawberries and pineapple to jello and stir to combine. Divide in half. Pour half of jello mixture into a 12x18 pan. Refrigerate until set. 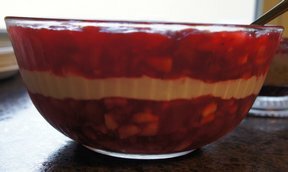 Keep remaining jello at room temperature. 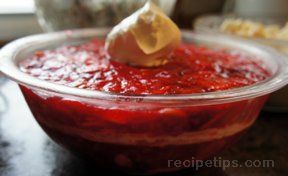 Spread sour cream evenly over jello in pan. Pour on remaining jello. Cover and refrigerate until set, about 1 1/2 hours or overnight.